Prabhupāda: We are inviting everyone. There is no restriction. And it is very easy. Just try to dance and chant. That's all. In the treatment they are taking part. That child is taught something of Kṛṣṇa consciousness. He'll be a very good child. So it is open to everyone. There is no restriction. Prabhupāda: That I have explained, that changing our body, there are 8,400,000's of bodies. So after death, you enter in one of the bodies. Prabhupāda: As happens... As you enter the body, the happening is according to the body. Student: But does this go on and on indefinitely or does it stop? Do you just keep changing bodies indefinitely or does it end? 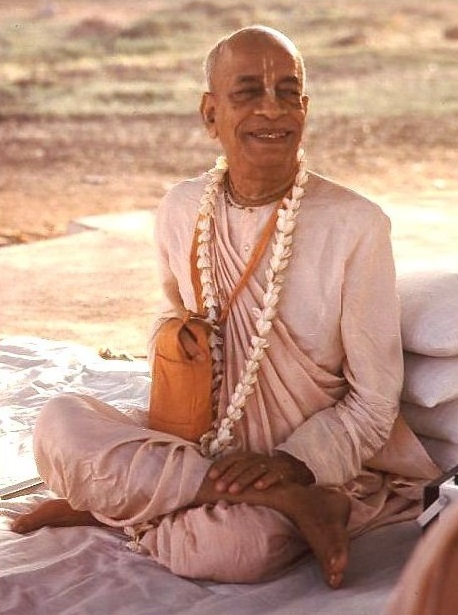 Prabhupāda: Not indefinitely. If you become Kṛṣṇa conscious, then you haven't got to change this material body. You are transferred to the spiritual world. There is eternal body. Student: Oh. Does everyone go there or only some? Prabhupāda: It is accepted that everyone goes. But if somehow you are stubborn to remain here, how one can help? (laughter) Just like the university is open for everyone. But somebody is stubborn to go to the prison department. So how the government can help? Government does not say that "Some selected people come to the university, and others go to the prison department." It is open for everyone, but it is the particular mentality—one is going to the university; one is going to the prison house. That is your individual independence. That is your choice. Just like so many students, they have come here. Others have not come here. So everyone has got little independence. So everyone can go to the spiritual world if he likes. But if he does not like, he will remain here. That is his choice.